Okay, bear with me for a bit of anatomy here: although we often think of the hamstrings as one muscle, it is actually group of three muscles: the biceps femoris, the semimembranosus, and the semitendinosus. All these muscles have slightly different orientations. The Hamstrings start at the sit bones, and are made up of three muscles. In general, all the hamstring muscles start at the sit bones and end up attaching into the lower leg bones. So, to stretch them, you have to get the sit bones and lower leg bones as far away from each other as possible. Some ways to do this is are straightening the leg at the knee or bringing the thigh in toward the chest, which draws the lower bones farther away from the sit bones. Another way to do it is to tilt the sit bones away from the lower leg bones–this happens naturally when you hinge the torso forward toward the thigh. 1. 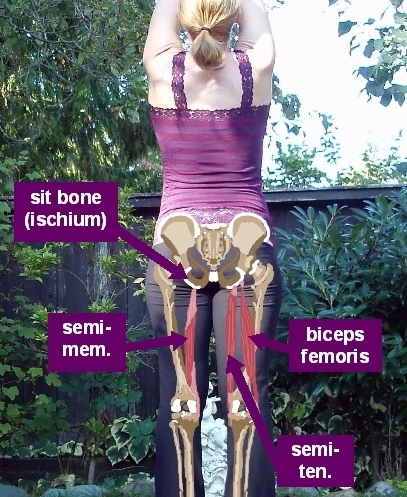 For a deeper stretch, actively tilt the sit bones away from the lower leg bones. In some poses, such as half splits, you have quite a bit of control of how you tilt the pelvis. If you keep the sit bones tucked under, you are taking some stretch out of the hamstring muscles and sending it into the low back muscles. Half splits with sit bones tucked under. To maximize the hamstring stretch, think about contracting your low back muscles to tilt the sit bones toward the back of your mat. Half splits with sit bones tilted back. This tip can be applied to downward facing dog and standing forward bend as well. Even in a seated forward fold, you can “walk” the sit bones back. 2. You don’t have to straighten at the knee to get a good hamstring stretch. The hamstrings are one of the few muscle groups in the body that cross two joints: the hip and the knee. For those of you who are sensitive behind the knee, you’ll be happy to know that you don’t necessarily have to straighten the knee to get a good hamstring stretch–work from the hip joint instead. For example, if you’re doing a hamstring stretch laying on your back, you can focus more on bringing the thigh in toward the chest than straightening the knee. Find a balance between these two actions: you should feel a stretch in the back of thigh without feeling discomfort behind the knee. Hamstring stretch with bent knee. In this pose, it’s easy to let the sit bones and tail bone curl up upwards, which can take away from your stretch. For a deeper stretch, lengthen the bottom leg out along the mat, so your legs make an ‘L’ shape from the side. 3. Rotate the legs to stretch different hamstring muscles. The hamstring muscles are all stretched best at different leg orientations. The biceps femoris is stretched best when the thighs are rotated medially (think toes turned in toward the midline of the body). The semimembranosus and semitendinosus are stretched best with thighs rotated laterally (think toes turned out away from the midline). Having toes turned in stretches the biceps femoris. Next time you do a standing forward fold, experiment with toes turned in and toes turned out and find out where you hold your tension. This entry was posted in Muscle and tagged hamstrings by Barbie. Bookmark the permalink. I really appreciate the information and excellent graphics provided in your blog. Yoga participants will really benefit from your desire to share such useful information. Hi Keryn 🙂 Can you come to BodyTalk Access tomorrow!? Good quseiton~ It’s not that we need to stop moving in our full range of motion- quite the opposite actually. We will be moving MORE once we can embody our physical intelligence to a deeper level. If you noticed when you did the exercise, you actually got MORE flexible on the side you squeezed’. So, you now have more range to move in and through- which is super important. The difference here is that you have achieved the flexibility in a healthy way, rather than forcing muscles to lengthen (and nerves and blood vessels to get longer and narrower which is dangerous.) As you understand you body more and move with greater awareness, this feel good’ factor will grow- a lot and become something you are feeling ALL the time! Not just when you’re in yoga class!There is much much more that I could say on this topic so, maybe a follow up video is on the cards but for now, keep improving your proprioception, and starting to recognize when you’re working WITH your body vs against it. TBC Much love dear xox You coming to the shoulders and heart workshop next weekend?